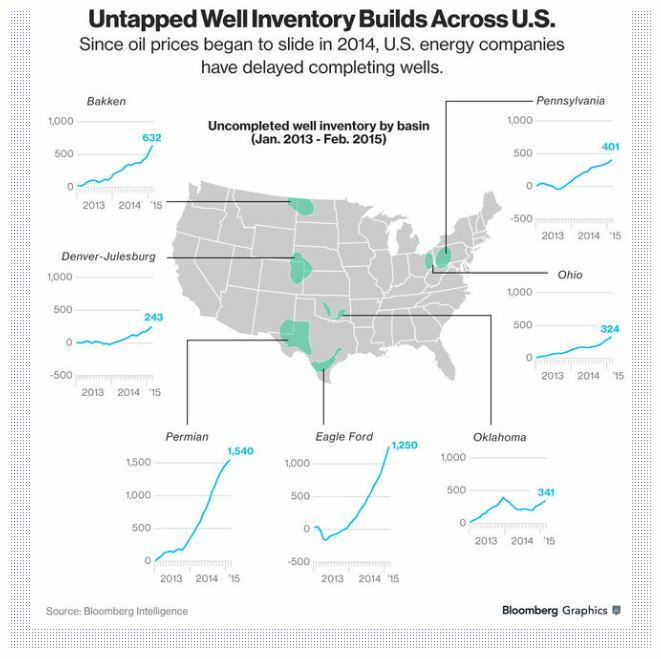 Bloomberg says that these uncompleted wells, if completed (that is, hydraulically fractured), would produce 322,000 bbls/day, equivalent to the current production of Libya. 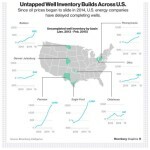 Total drilled but uncompleted wells, according to Bloomberg: 4,731. The study looked at water use in the Bakken and Eagle Ford plays. The ratio of water used to oil produced ranged from 0.2 to 0.4 gallons of water for each gallon of oil produced over the lifetime of a well in both plays – or 0.03 to 0.06 gallons of water per million British thermal units of energy from the oil produced. In comparison, U.S. conventional production uses from 0.1 to 5 gallons of water for each gallon of oil produced. The Ohio Department of Natural Resources has imposed rules on exploration companies requiring seismic monitoring around new well sites near fault lines and quake epicenters in the Utica Shale. According to the Columbus Dispatch, the rules require monitors at new drill sites located within 3 miles of known fault lines or areas that have experienced an earthquake greater than magnitude 2.0. Monitors cost about $20,000 each, and as many as five are needed at each well. “ODNR officials said if monitors at drilling sites detect even a magnitude 1.0 quake, fracking will immediately stop and an investigation will start. If fracking is blamed, a moratorium would be instituted 3 miles around the epicenter,” according to the article. Earlier earthquake activity near Youngstown, Ohio was attributed to an injection well, which was shut down by Ohio DNR. Earthquakes in Oklahoma and North Texas in the Barnett Shale, and more recently in the Eagle Ford in South Texas, have been linked to injection wells, but not to hydraulic fracturing. The Texas Railroad Commission has hired a seismologist to study the matter but has not imposed any new regulations on injection wells. Here is the Washington Post’s review of Josh Fox’s sequel documentary Gasland Part II, recently shown on HBO. I’ve previously written about Fox’s controversial criticisms of hydraulic fracturing, including a “counter-documentary” called FrackNation. In following news coverage of the growth of shale exploration and development in the popular media, I have learned that the media does not do a good job of covering complex issues like hydraulic fracturing, global warming, and gun control, issues that are easily exploited by parties on both sides of the issue by invoking scare tactics and consipiracy theories to frighten the public. I have also seen how such complex, controversial topics are politicized, like so much of public discourse today, into black and white, red and blue, with no middle ground, making it very difficult for the ordinary citizen to become informed about the facts and policy issues that political leaders should be investigating and deciding. Where is Walter Cronkite when we need him? 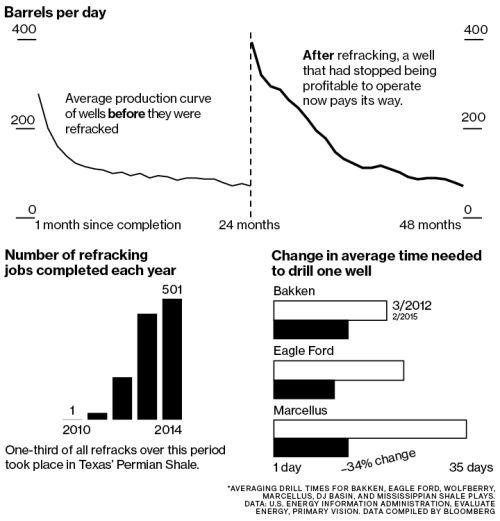 Does Hydraulic Fracturing Deplete Water Supplies? I recently ran across an article on the Energy In Depth website titled “Turning Natural Gas Into Water: Hydraulic Fracturing Doesn’t Deplete Water Supplies.” Energy In Depth is a website of the Independent Petroleum Association of America dedicated to “a research, education and public outreach campaign focused on getting the facts out about the promise and potential of responsibly developing America’s onshore energy resource base ” The article responds to an argument made by many organizations concerned about the large quantities of water used in fracing. The concern is that, while many uses of water return that water to the water cycle, water used in fracing is usually disposed of by injecting it underground, where it will never return to the water cycle. Energy In Depth’s response to this argument is that, while injecting the used frac water — called “flowback” — does remove that water from the water cycle, the burning of the gas (or oil) produced by the wells creates more water than was used in the fracing of the wells. So, the argument goes, fracing of wells actually “creates” new water that is added to the water cycle. EID’s article goes on to calculate that, while a typical Marcellus gas well will remove 4 million gallons of water from the water cycle, that well will produce two billion cubic feet of gas which, when burned, will yield about 22 million gallons of “new” water. Within the well’s first six months of production, the gas it produces will create more than 4 million gallons of water when burned as fuel. Problem solved! I asked a hydrologist friend of mine to look at EID’s calculations. He agreed that their math is correct, but he cautioned that the problem is not so simple. EID’s argument assumes that the energy created by burning the natural gas from EID’s typical well would not have been created by the burning of other fossil fuels. If, in other words, the gas is burned to create electricity, and if that electricity would have been created by burning coal if the well had not been drilled, then the net result is that water has been lost to the water cycle by injecting the flowback from the well. A memorial service, open to the public, will be held today for wildcatter and philanthropist George P. Mitchell – actually, three memorial services, as befits one of the great Texans of the 20th century. The Houston Chronicle in fact named him Houstonian of the Century. By all accounts, he was not only an entreprenurial genius, but a kind and generous man, a family man, and a man who gave back to his communities in many ways.